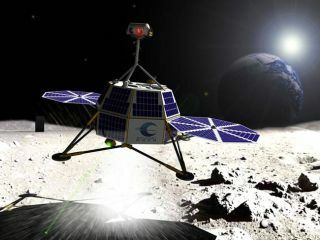 An illustration of the lunar lander concept for Odyssey Moon, one of the private companies competing in the Google Lunar X Prize to land a robot on the moon. Whenthe $30 million Google Lunar X Prize premiered, the first official team to signup was Odyssey Moon — but the company has plans far beyond winning or losingthe private race to the moon. "OdysseyMoon is about an ongoing commitment to lunarenterprise," said Robert Richards, Odyssey Moon Founder and CEO. "We believe there is a long-term business opportunity with the governmentand commercial partners." Richardsand his multi-national team partnered with the space technologies company MDAof Canada to launch their "Moon One" (M-1) Lunar Lander in July 2011.They hope not just to win the Lunar X Prize, but also to kick off the first ina series of low-cost robotic missions to the moon. Winningthe Google Lunar X Prize requires private teams to land a robot on the moon andcomplete several tasks, including traveling 1,640 feet (500 m) and sending highdefinition images back to Earth. Thecompany has already jumped aboard a new commercial "moon rush" — itannounced plans last year to fly cremated humanremains to the moon, as part of a partnership service with Celestis.Odyssey Moon also signed on recently with Paragon Space Development Corporationto help deliver the firstflower to the moon. OdysseyMoon is focused on developing a suitable launch vehicle and their M-1 LunarLander, as opposed to other teams that have displayed early lunar roverdesigns. Richards characterized the Google Lunar X Prize as "a landercompetition, not a rover competition," and noted that the challenge was ingetting the lander to brake, descend, and land safely. That means looking totested and reliable technology that can do the job. "There'sno new physics, this isn't magic, and we're not trying to break technologybarriers per se," Richards told SPACE.com. "I'm very agnostic[on the technology]." Findingfinancing for a private moon venture has proven challenging for every team, butOdyssey Moon's partnerships reflect an aggressive attempt to attract resourcesand investors. Richards pointed out that the previous Ansari X Prize, a $10million suborbital spaceflight competition won by Burt Rutan's ScaledComposites in 2004, has added credibility to the Google Lunar X Prize. "We'vegone from the giggle factor to the Google factor,"Richards noted. "People know that it's serious branding and a seriouseffort." Richardssees the Lunar X Prize as "something to support because I believe in thepower of the prize" to help catalyze a growing space industry. However, heis also driven by a vision beyond making moon bucks from space ventures. "Ifirmly believe that we have to expand humanity's focus from a one-planetsociety to a multi-planetary mindset, and the moon is a perfect platform?forstepping out into the solar system," Richards said, adding that hecredited Carl Sagan for promoting the space pioneering spirit. That explorationimperative is declared even more boldly on Odyssey Moon's website. ?Futuregenerations will view the Google Lunar X Prize as the turning point of the 21stcentury, when humanity realized the Moon?s critical role for prosperity andsurvival in space and on Earth,? Richards has said. Thatcombination of entrepreneurialspirit and Sagan's vision means Odyssey Moon intends to go all the way,regardless of the Google Lunar X Prize outcome. "Wehave our eyes on the prize, but if do not win, we will applaud those who do andcontinue," Richards said.